The Brazilian Grand Prix will probably not go down as one of the most exciting races in history, but it did provide one memorable moment. Fernando Alonso, fresh from another early exit in qualifying following his McLaren's engine failure, decided to make the most of his spare time to grab a marshal's chair and soak up the sun. It has been a miserable season for the two-time world champion, who has retired from seven races and finished in the top 10 just twice, but at least he was able to see the funny side. In space no-one can hear you scream: "GP2 engine! GP2 engine!" Has Rosberg found Hamilton's secret? 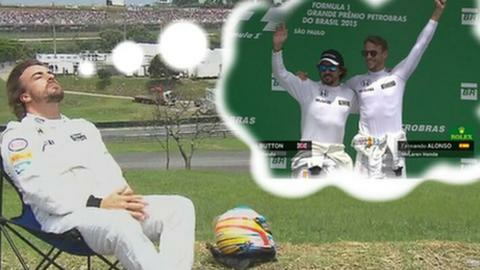 Read more on Brazil Grand Prix: Has Rosberg found Hamilton's secret?